That should be the first word out of your mouth when browsing the 98 kilogram weight class set at the 2017 Greco-Roman World Championships. There are beasts everywhere you look. Leading the pack is one of the very best on the planet at any weight, the immensely-successful Artur Aleksanyan (ARM, world no. 4), who already owns two World titles along with an Olympic gold. He’s not alone in the crowd, however. You also have last year’s silver and six-time Pan Ams winner Yasmany Lugo Cabrera (CUB, world no. 1) as well as 2009 World Champion Balasz Kiss (HUN, world no. 5). Once you add in the hardware from the Junior age group, the field looks even more imposing. All told, there are four former Junior World champs here along with almost a dozen medals altogether among the top competitors. One of those medals happens to belong to an American. G’Angelo Hancock (Sunkist, world no. 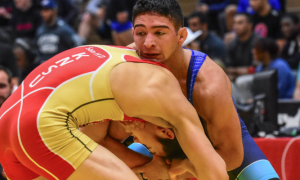 16) has taken the US Greco-Roman world by storm since his arrival on the Senior circuit nearly two years ago and has already carved out a place as a name opponents from other countries pay attention to. There’s a good reason for that. Hancock, 20, possesses uncanny strength and quickness that cause problems for everyone he faces. He’s also dynamic when opportunities to score present themselves. If Mr. Hancock can seize momentum early, he is someone who can certainly wind up making a run towards history. But it won’t be easy. Nor it is supposed to be. This is a bracket full of monsters and no quarter will be given to the weary. If you’ve been searching for a weight stacked from head-to-toe, look no further than this one. One of the three (or four) most decorated wrestlers in the entire tournament, it is important to remember that Aleksanyan is still not even 25 yet and what he has already accomplished is ridiculous to the point where it’s almost bothersome. However — what he did not accomplish this year was earning himself another Euro title, as Felix Baldauf (listed below) downed him via criteria early on to throw more fire on a hot streak that resulted in the Norweigian’s first title at the prestigious event. That’s probably just details. Aleksanyan hasn’t competed enough since Rio to nail down whether or not ordered par terre’s absence actually means a big problem for him, and a controlling, energetic win in the Euro bronze match over Dmitriy Timchenko (listed below) suggests that he’ll wind up once again looking just fine as he races to another spot on the podium. 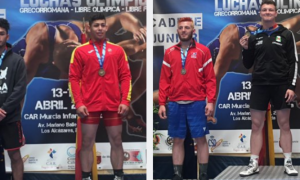 Like Aleksanyan, who defeated him in the Rio Olympic finals, Lugo Cabrera hasn’t seen a ton of action since last August, as he also only returned to international competition at his continental championships. He won, of course. On his way to victory at the Pan Ams, Lugo Cabrera defeated American whiz kid G’Angelo Hancock after the latter attempted a throw that saw the Cuban counter and land on top. Perhaps too much stock shouldn’t be put into that result for either guy. Lugo Cabrera’s game in the previous rule-set was not solely focused on par terre offense or defense, he could score from his feet, too. He might need to be a little more active in the tie-ups to avoid getting dinged for passivity primarily because he tends to be a patient sort. But when he does turn it on, he can be extremely effective. Nuriev could be working with some good static in Paris. Outside of a heartbreaking loss to Yahor Yaskavets (BLR) at the World Cup in which he was leading the entire time until Yaskavets double over’ed him to steal the bout, Nuriev was wrestling the best out of every 98 at the two-day event with an inspiring win over Maksim Safaryan (RUS) serving as the highlight. He followed that strong performance up with another one at the U23 Euros and then in May, won the Islamic Solidarity Games. As a competitor, Nuriev is a blood-in-the-water type. If he is clicking at a high level and senses that opponents are beginning to fade, he is all over them. He’s more consistent than he is dynamic, though. Nuriev prefers a steady work-rate in most of his matches and when it’s time to strike, he tries to. Definitely a live contender to keep an eye on here. For as tough and talented as he is, if Baldauf doesn’t win the European Championships, it’s likely he is not thought of as a major threat to emerge at this tournament. But that’s the thing — Baldauf has figured out how to win. He has learned how to bite down and grit out those grinding exchanges to force his positions and he’s also converting tiny windows of opportunities into meaningful points. Yes, yes, he impressed at the Euros with several gut-them-out victories, including a heart-throttling decision over Aleksander Hrabovik (listed below) in the final. You saw it again at the Pytlasinski Cup last month. Baldauf escaped on criteria in the first round against Uzur Dzhuzupberkov (KGZ), won his next two, and then needed to show some life in the final against Aleksander Golovin (RUS) in order to nab a 2-2 criteria win there, too. That’s what Baldauf does right so many other upper-weights don’t — whenever he is warned for passivity, he gets his legs moving and attempts to pick up the pace. You may not like the rule, but that’s what it is designed to do. Baldauf isn’t afraid to operate in that framework, which is a big reason why he might just do something big on Monday. Timchenko is a pleasure. He has an understated way of doing business, like a guy who puts his hard hat on, punches the clock, and gets to work. You just don’t have to worry about an honest effort out of him. Timchenko, unlike many of the Europeans, has managed to stay afloat with the rule change because of his willingness to engage with purpose. He doesn’t stop moving or allow himself to get bogged down in the pummel. He and Baldauf put on an entertaining match at the Euros which the latter took on criteria. That sent Timchenko into the bronze medal bout where Aleksanyan prevailed 5-0, which was an improvement over the 10-1 shellacking the Armenian dished out to him at the Vegas Worlds two years ago. But during that bout in 2015, he got turned from forced par terre. That is not something for him to worry about in Paris. Not really, anyway. There’s every reason to believe Hrabovik could manage to finally nail down a medal on Monday, though his draw is going to be questionable since he isn’t carrying over any seeding points from the Rio Olympics. He’s not alone on that front. Hrabovik looked solid at the Golden Grand Prix in November where the man listed below bested him in a rather uneventful final on passivity. The Hungarian Grand Prix provided a somewhat different look for the Belarusian. Hrabovik had more bounce in his step and seemed to get the gist that an increase in energy would serve him well. He wasn’t just hanging in anymore, he was demonstrating more urgency in exchanges and at times, forcefully breaking off tie-ups to improve position. Baldauf edged Hrabovik in the Euro finals, and that’s the last we’ve seen of him. Definitely a threatening presence, though. The case is different with Russia’s resident ginger assassin. Unlike someone like Hrabovik, there are no guessing games. Evloev is not going to be given a favorable draw since he isn’t rolling into Paris with any points whatsoever. That means he is going to likely have to fight for his life to make a run, which honestly, is what you want to see out of him. Evloev is at his absolute best when he’s being pressed and he can rain down serious firepower. That is, when he is making legitimate attempts. Evloev can be suckered into a brawl that doesn’t go anywhere and has shown at times that he is susceptible to tug-of-war tie-ups that also, don’t go anywhere. He had to grind it out at the Russian Nationals but scored a couple of signature wins on his way to gold. Hancock only recently turned 20 years old, so it would be a bit melodramatic to say “this is his time.” Although, it sort of feels like it could be. As a brilliant-but-troubled high school stud, Hancock was introduced to Greco-Roman at the perfect time in his life. Retired US Olympian TC Dantzler played a vital role in getting the Colorado native involved in the goings-on at the Olympic Training Center and soon enough, Hancock became a resident athlete. From then on, it has been a whirlwind. In 2016, Hancock sewed up a spot on the National Team by virtue of taking third at the Olympic Trials. He spent the rest of the year turning himself into a star. 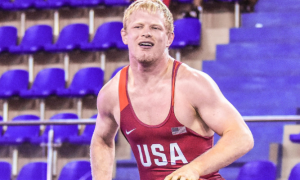 Wins at both the Junior Greco World Duals and the University Nationals set the tone. Outside of losses to a few experienced Seniors earlier in ’16, he was positively dominant the rest of the way, bodylocking practically everyone in his path. Hancock continued to impress at the Junior World Championships later that summer, earning a bronze medal to cap off an outstanding run of success. He kept it going right away. November saw Hancock win the Klippan Cup and the Bill Farrell Memorial, respectively. A month later, he took home his first Senior Open title. In the finals of the Farrell and the Open, Hancock battled with fellow 2016 National Team member Hayden Zillmer (Minnesota Storm). Both wins were close, white-knuckle affairs, and each guy provided the other with a domestic rival to hone in on. They met again in the finals of the Schultz, where Zillmer appeared close to snatching victory before Hancock came back late to steal the show. With the spring approaching, Hancock stomped through the Austrian Open, in the process helping the US reach the top of the leaderboard at that event. The next week wasn’t as kind to him. At the Zagreb Open, he fell via tech to 2016 University World bronze medalist Ilya Borisov (RUS) to come in eighth. Details deserving of dismissiveness. 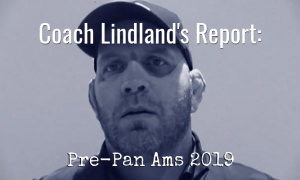 As expected, Hancock and Zillmer resumed their rivalry in the best-of-three finals at the World Team Trials where once again, he managed to squeak out two difficult decision victories while securing his first spot on a Senior World Team. In terms of actual competitiveness, you could say that Hancock and Zillmer brought the best out of each other. Their bouts, all five of them, rarely saw much in the way of high-paced action. But throughout their combined 30 minutes of match time (if you are so inclined to go back and look), you’ll see that every single position was hotly contested. The pummel was ferocious and Zillmer might have been the perfect US counterpart at this stage in Hancock’s career. An unquestionable talent, Hancock needed to be pushed by somebody on these shores. The fact that Zillmer had also begun to progress rapidly in his own skill-set delivered the resistance necessary for Hancock to make adjustments in-match that could prove valuable against the litany of accomplished Seniors awaiting him in Paris. Immediately after the Trials, Hancock, along with the most of the US team (minus Ildar Hafizov, Ellis Coleman, and Mason Manville), competed at the 2017 Pan Am Championships in Brazil. This was important, for on his side of the bracket resided Lugo Cabrera and Kevin Mejia Castillo (HON). Castillo had defeated Hancock twice previously, both times in 2016, back when the kid was just learning the ropes. 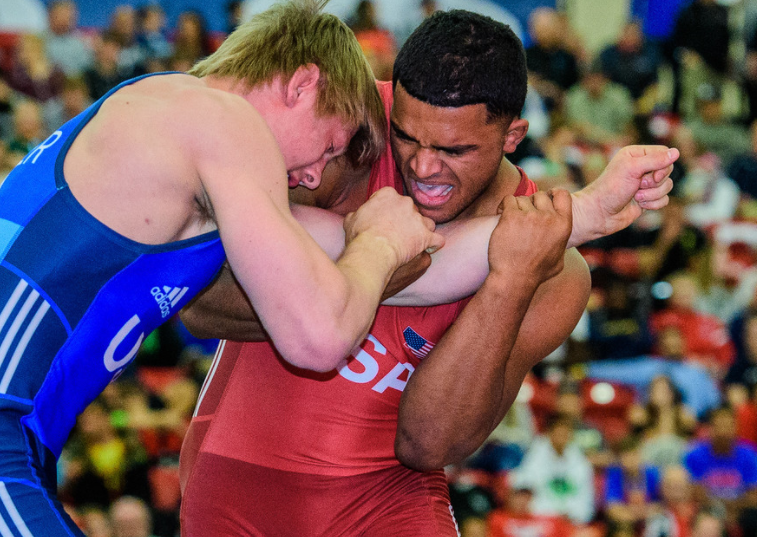 It was a decidedly different set of circumstances in their quarterfinal bout at the Pan Ams. Hancock shut down the Honduran en-route to a 5-0 victory that put him with Olympic silver Lugo Cabrera in the semis. He was hanging in there beautifully, even owning a few exchanges. His undoing came on a scoring attempt. With the score at 2-2 in the first period, Hancock got in on one of his patented bodylocks and as he tried to arch it back towards the edge, Lugo Cabrera contorted his body and landed on top of him. That was the turning point (no pun). 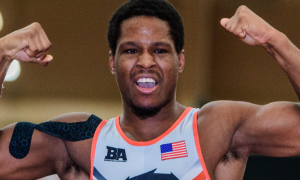 But Hancock rebounded in style, picking up a snappy 8-0 tech in the consolations over Thomas Barreiro (CAN). 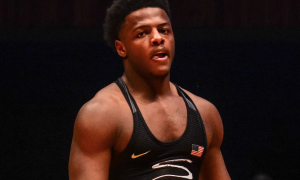 Due to the procedures put in place that allowed Hancock the opportunity to wrestle off for his place on the Junior World Team later on, he was forced into one heck of a busy day. 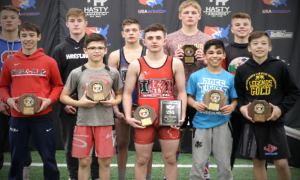 The University Nationals in Arkon, Ohio in June meant at least two matches with Junior Trials champ Blake Smith (NMU-OTS) as well as a full slate of competition in his University bracket. Hancock found little trouble blitzing Smith in two straight bouts, but fell in the University finals to Zach Merrill (NYRTC) in an odd caution-filled bout, though he did give up six offensive points during the proceedings. Again, this is the kind of thing you toss to the side when talking about Hancock if only because the day as a whole was a long one and that match could have been officiated better. The 2017 Junior World Championships arrived with Hancock being seen as a major contender to win gold. He began the day with drubbings of Damion Von Euw (SUI) and Kiril Mile Milov (BUL) to breeze into the quarters. And then he was robbed blind. Holding a 3-2 advantage in the second period against Suleyman Erbay (TUR), he was blatantly leg-fouled during a takedown attempt and the one-point lead turned into a one-point deficit in the blink of an eye. Erbay didn’t advance to the finals, which eliminated Hancock from having a shot at his second consecutive Junior medal. And that’s where we left off. When you look at Hancock’s history against international Senior opponents over the past 9 months, you will find a record in the neighborhood of 7-3, with one of those losses to the reigning Olympic silver. Likewise, one of those wins came against a more-than-reputable name in the likes of 2016 Olympic bronze Cenk Ildem (TUR, world no. 10) at the Clubs Cup in November. The win over Ildem was not due to some nifty moves or a big throw — rather, it was because Ildem groin-checked Hancock and got called for a caution-and-two, which was the sum of the scoring. But it still counts and it still means something, if only because it spoke to Hancock’s recognition of his own abilities. He flustered the Turk repeatedly, backed him up, and what’s more, was mature enough to realize that if he could maintain his positioning the way he wants to, he is incredibly difficult to score on. And that is a very big deal when we’re talking about an athlete who is getting ready for a World Championships. Of course, offensive points are where it’s at and as we keep discussing on here, no American wrestler will be able to win a medal without them. Between the uber-high level of defense these wrestlers showcase and the oft unforgiving nature of the officiating, there won’t be a ton of favors waiting for any of these guys in Paris. That’s just reality. The nice thing about Hancock, is that he will definitely try to score. He knows how strong he is, how smooth he can be, and understands that good things tend to happen when he gets to the body. It is not unreasonable to suggest that he will take an offensive approach here because he has to. He will undoubtedly be called for passive and that’s okay. It is what he does after that which will tell the story. If he is going to be willing to stay composed while also ratcheting up the aggression when it’s called for, he can have a real shot to advance into the money rounds. We usually become tantalized by the draws, where a wrestler will be placed, or whom he might have first round and make no mistake about it, that all makes a difference. Hancock is not going to be provided with a great starting point and it’s as safe a bet as any that his first opponent will be someone with more credentials than he. If that does not matter to him, then it shouldn’t to you, either. This is a wrestler who makes it no secret that he feels he is a World-caliber athlete and he has certainly demonstrated that is indeed the case. G’Angelo Hancock is not a candidate for a medal because he is excellent. He’s a candidate for a medal because he knows it. If anything matters, that does the most. Kiss took a hard-luck loss (sort of) to Hrabovik at the Euros but bounced right back to snag bronze. He’s a dangerous guy when he switches it on, but he needs willing opposition in order to look his best. There’ll be plenty of those available Monday morning. 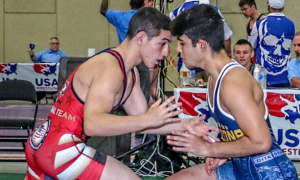 An undercover threat for this bracket, Salehizadeh is a serious, serious competitor who can frustrate opponents with his aggression and agility. He doesn’t get knocked off his spot too often. Salehizadeh will actually try to throw, which more than you can say for other guys. Things could get interesting for him here with the right breaks.